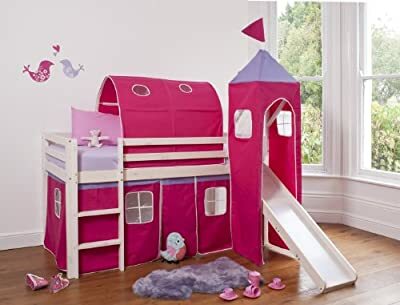 Transform your little girl's bedroom with our fun Pink Princess cabin bed. 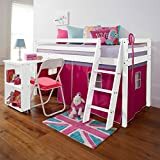 Combining a quality solid wood mid sleeper with a secret hide-away underneath, this bed is the perfect place to play whilst providing ample storage for tidying away your little one's clutter. A real winner among children and parents! 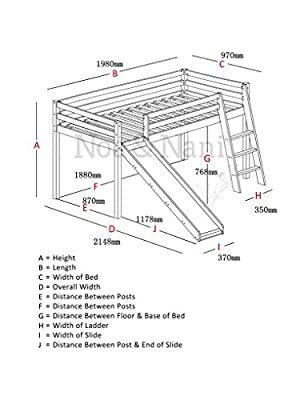 Solid pine Mid Sleeper Cabin bed with Play Tent 101cm(Width) X 202cm (Length) X 114cm (Height) size of bed (not including Slide) Tower, Tunnel , Tent and Slide Included This item comes flat packed for delivery Unfortunately due to the size of the item we are unable to ship to Scottish Highlands or Islands , the Channel Islands or Northern Ireland. If you are unsure please contact us.